The film, which is out in June, concludes director Christopher Nolan's superhero trilogy - and the plot has been a closely-guarded secret. "I was in a panic for 20 minutes," Oldman told the BBC. "I thought, 'where the hell have I put it?'" "It had my name on it," he added. "They would have killed me". The script eventually surfaced in his hotel room. "I'd gone out for dinner," the actor explained, "and I had put it in the room between the mattress and the bed, because I couldn't scrunch it into the safe. "I was half-thinking about something else and shoved it there." 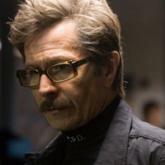 The 53-year-old, who plays police commissioner James Gordon in the film series, admitted the script would have been "the worst one to lose." He described the lengths that Nolan and film studio Warner Bros went to to ensure the script remained under wraps. "When he [Nolan] gives the script out, it doesn't have the ending. Characters sometimes change, or their names change. And you have to go to the studio to read it." Oldman was speaking at the Empire film awards, where he received the best actor prize for his role in Cold War thriller Tinker Tailor Soldier Spy. He was not the only actor on the red carpet who described the security measures currently being employed by film studios. Mark Strong was at the ceremony during a break in filming Zero Dark Thirty with director Katherine Bigelow, who won an Oscar last year for The Hurt Locker. The film, which has been on location in India, is a dramatisation of the raid by US Navy Seals on al-Qaeda leader Osama Bin Laden's home in Abbottabad. Strong said the producers wanted the script to be "as secret as possible". "You have to apply to read it on your computer," he told the BBC. "If it detects that you haven't read it for a couple of days, it disappears off the computer." "When you are reading it, if it detects after five minutes that you haven't turned the page, the text goes blurry." He said the tight security was because the script went into detail on "a lot of CIA procedure" that had been described by "the people who were involved" in the raid. Oldman said there was also a sound commercial reason for the secrecy surrounding screenplays. "There's a website that gets hold of scripts and reviews films before they're made, so I can understand the paranoia."